The COBB Tuning Stainless Steel 3” Turbo Back Exhaust was designed to be everything we were looking for in an exhaust system — a complete, truly engineered system, that offers optimal performance, tasteful looks, and unparalleled durability without a loud and obnoxious exhaust note. 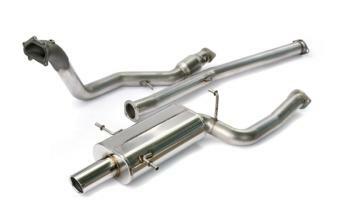 The system is offered with a high flow catalytic converter, or no catalytic converters, in the downpipe. This is a direct fit replacement to the stock exhaust unit. Constructed purely from 304 Stainless Steel, this system features our cast stainless steel bellmouth to mandrel bent 3” piping, a state-of-the-art metallic substrate catalytic converter, a stock-style flex gasket, our low restriction straight-through muffler that tucks up nicely under the car and ends in a tasteful but not overstated 3.5” double wall tip featuring an etched COBB logo.